A violation of trust is how some Crashplan subscribers have described how they feel. Code42, the developer of CrashPlan, said it’s exiting the consumer backup market in favor of business backup instead. Backing up your files to the cloud is a practical and reasonable backup strategy. But it shouldn’t be your only backup strategy. One backup is the same as none at all. Backup redundancy assures you that no matter what happens to your devices or your backup services, your data is safe somewhere. My work at Backblaze included frequent references to the 3-2-1 Backup Strategy. It’s a good starting point. I have some additional ideas I’d like to share here, but here’s the executive summary. Keep your data in three places. One or more local backups. For too many of us, the live copy – the copy resident on your work computer or device – is the only copy in existence. We should all know that live data isn’t safe: You can mess it up, and that’s by far the biggest reason why you’ll need to recover it later. But things can go wrong – computers, even Apple computers, and devices – stop working unexpectedly. I used to work in a computer store, and I’ve supported users through several different careers, and I constantly, constantly hear “I’ve never had a problem with my computer before” as an excuse for why they didn’t back up. That’s no excuse. We all know computers can be backed up – we just don’t do it because we perceive it as difficult, expensive, or, when you’re honest with yourself, just drudgery you don’t want to be hassled with. Mac users have a reasonably reliable and inexpensive way to get started with home backups. It’s called Time Machine, and it’s built right into the operating system. Hook up an external hard drive with enough room to back your hard drive and Time Machine will do so automatically, backing you up with hourly snapshots for 24 hours, maintaining daily backups for the past month, and keeping weekly backups until the backup disk gets full. This way you can quickly restore files and folders you’ve deleted or changed. What’s more, you can restore versions of docs you’ve overwritten or modified. Saved changes to your novel manuscript that you can’t undo? Open up Time Machine and recover the version from three hours ago, before you hit the bottle of Buffalo Trace. The best part about a Time Machine backup is that if the external drive is big enough, you can back up more than one Mac to it with no problem. The same Time Machine disk I use for my MacBook Pro is also my Mac mini backup drive. If your budget allows for more than one external hard drive, you can actually rotate your Time Machine backups too. Rotate them by days of the week or figure out some other frequency that works for you. Time Machine will keep each backup up to date. If something happens to one backup drive, you still have a complete backup on the other. Replace the bad backup drive, and you’ll be good as new. Some folks opt for network-based backups. Apple’s defunct Time Capsule is still an excellent way to do this, even though it hasn’t been updated in quite some time and Apple has reportedly disbanded the engineering group responsible for it. If you’re looking for a non-Apple solution, Network Attached Storage vendors like Synology and QNAP offer directions to make their devices work a network-based Time Machine backup. Check with your product’s vendor for more info. I’d be remiss not to mention cloning software as another option for local backups. Cloning apps create mirror-image backup copies of your Mac’s hard drive, producing a bootable system that can be up in minutes. Need to keep your Mac running no matter what? Cloning is a good idea. I currently use Shirt Pocket’s SuperDuper, for whatever that’s worth. 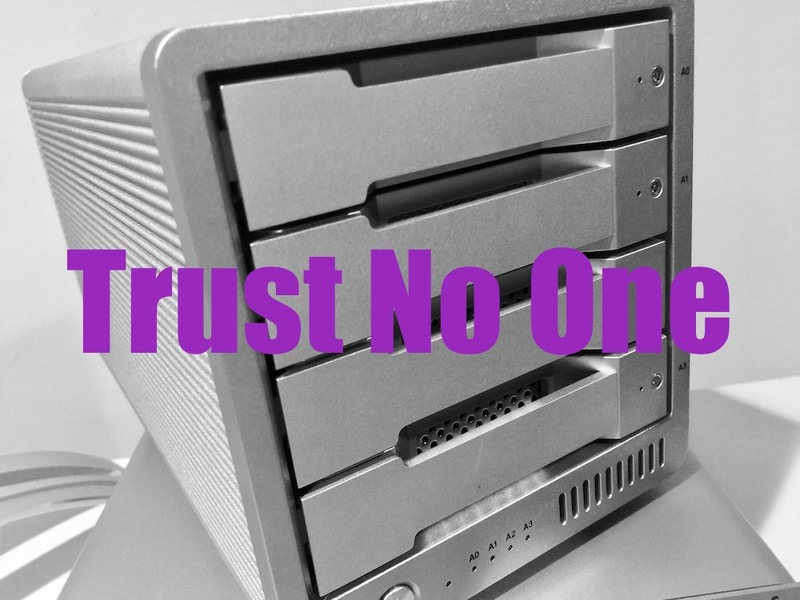 An Offsite Backup: Who Do I Trust? Look, not to go all Fox Mulder here, but Crashplan’s consumer product pullout demonstrates an important principle: You can’t trust anyone else when it comes to the safety of your data. And you probably shouldn’t trust yourself, at least not alone. That’s why your first defense against data loss should be the local backup. Preferably multiple copies, but that amount of redundancy may not be for everyone. Then find an offsite service that you trust to store your data. Use them as a secondary line of defense. Which one you choose is entirely up to you. There are different options like those I mentioned at the start of this article. iCloud, Dropbox Pro, and other file sync and online backup services are out there. Figure out what fits your pocketbook and your technical needs. Look for services with strong encryption and a good reputation for customer service. Next PostSpeed up your 2014 Mac mini with this upgrade!